Today is the second Sunday of Advent and it is also time for another treat from the Anne Boleyn Files advent Calendar. For the 9th December, we welcome historical novelist Sean Poage to the calendar with a very interesting article. Thank you, Sean! All you have to do to enjoy Sean’s Tudor treat, and any that you have missed, is to click on either the number 9 here in this post or scroll up to the cover image at the top of this website and click on the link there. It’s easy! 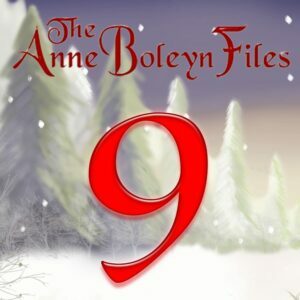 I do hope you’re enjoying the Anne Boleyn Files Advent Calendar. Do remember to visit us every day! Thank you Sean for that fascinating information. I’ve not heard that before. Thanks Sean for your article and insightful analysis. Henry Tudor wasn’t the first Mab Daragon or Son of Prophecy/Destiny as the Welsh poets applied it to Owain Glendower and to Owen Tudor and then his sons. Henry Tudor was the one who fulfilled the prophecy in hindsight because he was the one who made it onto the English throne, more through luck and treason, than actually fighting, but still he in the eyes of the poets and bards who wrote the histories fulfilled the prophecy. Henry played to it as any good Messianic figures would, with the symbols, the Red Dragon, the old family line claiming to go back to Cadwallader, an old Welsh hero, being related to Glendower, to the ancient legends of King Arthur and so on. Having no claims to the English crown, save a weak link via his mother to the illegitimate Beaufort family, once he won the crown in battle, again through treason, he was deemed to have been blessed by God. Henry needed to create a mysterious past for himself. A claim to be descended from King Arthur appealed to the British sense of history and people believed King Arthur had lived back then. He linked the old English capital of Winchester to Camelot and parts of the lands owned by the Tudors in Wales are associated with King Arthur and Merlin even now, while their lands in Monmouthshire link them to the Lancastrian Kings. Monmouth was the birthplace of King Henry V, another English hero and a great warrior. Windsor was also associated with the Knights of the Round Table and Edward iii made this the base for the Garter Knights and Henry Viii spent a lot of time here and was buried in their Chapel of Saint George. It was all symbolic nonsense but to the Tudors it was part of their legitimacy and their claims to power. Ceremony and pageantry and symbols were powerful tools for a King and they used them to bond with nobles and people and to display their wealth and power. It gave an impression of Divine blessing. If people thought Henry Tudor was a descendent of King Arthur he would be more easily accepted and as people enjoy a pageant, they are less likely to get bored and rebel. By naming his first born son Prince Arthur he was bringing the message home, carving out a future and showing people that a new age had begun, one linked to the Ancient King and maybe Arthur himself was reborn. Henry Viii continued this theme with his dressing up and tournaments and knightly pursuits and he had a Welsh Dragon firework fly across the sky at his meeting with King Francis in 1520 at the Field of the Cloth of Gold. I found it very interesting, I read also that William the Conqueror ‘s grandparents could well have been descendants of King Arthur but the writer does not believe that he had children who outlived him, and as its so far back it it impossible to get an authentic geanological line, i always assumed that Arthur was just a mythological figure like the dragons and his evil half sister Morganna or Morgan Le Fey who seduced him and later gave birth to their son Mordred who would be the ruin of his house, yet as the article says Mordred was later invented, so too was Sir Lancelot who is said to have been the imagination of a French writer, to me the the tales of King Arthur are reminiscent of the Greek heroes who done battles with the gods and some lived in honour, some in sin and those who were blessed in their afterlife went to live in eternal happiness in Elysium, others went to Hades, King Arthur is said to be the once and future king and lies sleeping with his valiant knights until the time when his country needs him once more, it is a pleasant thought and also that Merlin was enchanted by a beautiful fairy who trapped him in a tree where he remains to this day, and also sleeps the sleep of the enchanted till he is called upon once more, the Tudors can trace their lineage back quite far but the spelling was different and is confusing, the Welsh language to anyone but the Welsh can look and sound very confusing but it is an ancient language and I believe they claim to be the original British inhabitants of this island, I have a line of descent going back to Lewellyn the Great and his ancestry I have traced through Wikipedia though that in itself is not a great source of information, I think it is more than likely that Arthur’s siblings or cousins had descendants that maybe do live on in the royal family today, who knows? Bq is correct about Henry V111 and his desire to prove he had a Royal British lineage, Anne Boleyn herself eager to prove her father’s side had noble blood claimed the Counts of Boulogne were the ancestors of the Boleyns and it was not uncommon for many up and coming families at court, finding themselves amongst the older more noble families to claim a descent back to a Norman lord or such, I think it was the Duchess of Norfolk her aunt who scoffed at Anne when she made such a claim, her mothers lineage was in no doubt of course, such snobbery has always existed in England and I can understand why Henry V11 was eager to claim his share of Arthur’s blood, he even named his son after him and he must have been sure of his great future, however tragically his son was not destined to be another King Arthur, in fact we have never had another one and so to this day King Arthur does indeed remain the once and future King.